The bulk of the sculpture I make is large scale and designed for a specific outdoor site. has an accessible ‘message’, so that most viewers will relate to it. The materials I use and are always selected with durability in mind, given that they must withstand the elements and, in the case of a sculptural seat for example, the wear and tear of use. 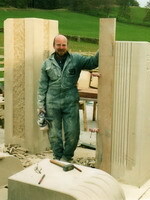 I still like to use hardwoods such as oak or elm for seat bases as timber is much more ‘bum friendly’ than other materials, but increasingly I find stone is viewed as the more durable option - most often one of the hard Pennine sandstones, sometimes limestone brought up from the south, and, occasionally, slate or granite. I also often use frost proof and concrete-hard ceramic elements in my work, particularly the tiles made by local community members in clay workshops. On several projects I have collaborated with an artist/blacksmith friend to incorporate open metalwork (usually stainless steel) as a contrast to the solidity of the main materials. Also, where appropriate, I have made effective use of re-cycled stone and wood, notably old hardwood crossing timbers. Most of my output is community-based, and usually involves design consultation and ‘hands-on’ workshops with all sorts of groups from schools, to youth clubs, to adult groups with a variety of special interests such as conservation volunteers, art clubs and local history societies. The product of these workshops is often incorporated into the main sculpture or sometimes used to provide ancillary displays, creating a strong sense of pride, identity and ownership within the community, which, in my experience, greatly reduces the chances of graffiti or other anti-social behaviour.